The Ultra-III could prove indispensable for cover band guitarists who need acoustic sounds in their repertoire, or for recording players who want quick access to a range of tones - Ultra, indeed. Feature-packed. Great tones. Looks superb. NanaMAG controls are difficult to access mid-song. 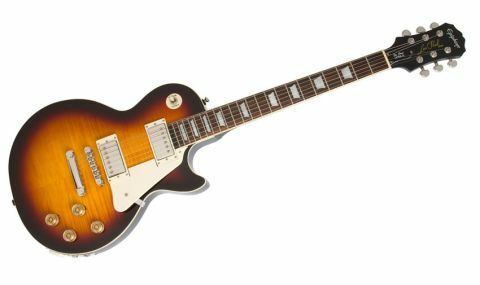 It's one of the world's most iconic guitars, but that hasn't stopped Epiphone and Gibson messing with the Les Paul. From Robot Guitars to ukuleles, Mr Polfus's creation has received its fair share of variations since its introduction in 1952. Epiphone's Ultra-III is yet another contemporary interpretation, and gives you acoustic-like tones, USB connectivity and a built-in tuner straight out of the box. "Grover tuners and LockTone bridge and tailpiece further reinforce this guitar's 'deluxe' feel"
This LP has retained its good looks, though. The Ultra-III's AAA flame maple veneer is simply gorgeous, while the white binding adds a touch of class. And despite the added electronics, the Ultra-III is relatively lightweight, too, thanks to a chambered body, while Grover tuners and LockTone bridge and tailpiece further reinforce this guitar's 'deluxe' feel. Where's the tech, then? Well, the Ultra-III has two pickup systems. The first is a pair of Epiphone's new ProBucker humbuckers, which ape Gibson's PAF-style BurstBuckers, with tones delivered via the standard magnetic output. The second is a Shadow NanoMAG pickup, discreetly installed at the end of the fingerboard, which captures the LP's body acoustics and string harmonics, and delivers them as an electro-acoustic signal via the guitar's NanoMAG output. There's more hidden around the bridge pickup mounting ring, though: as well as housing the built-in chromatic tuner, it conceals a set of LEDs that tell you which pickup system you're using, be it standard magnetic, NanoMAG or a combination of both. The guitar's four top-mounted knobs control neck volume, bridge volume, master tone and NanoMAG volume, and pressing the latter knob switches between the guitar's three output options. On the rear of the guitar, you'll find controls for NanoMAG gain, bass and treble to help you dial in your electro-acoustic tone, and a compartment for a nine- volt battery, which powers all the technical gubbins. And then there's the USB output, which lets you connect directly to your computer for use with software (Native Instruments' Guitar Rig 4LE is included), without an interface. "Those ProBuckers nail the classic Les Paul vibe, with toasty neck tones and chunky, classic- rock bridge sounds"
It's an impressive list of features, but the guitar needs to sound good, too. Fortunately, the Ultra-III delivers: those ProBuckers nail the classic Les Paul vibe, with toasty neck tones and chunky, classic- rock bridge sounds. Plugged into an acoustic amp, you get a pretty convincing piezo electro impression, and running the guitar in stereo with a lightly overdriven valve amp is all kinds of awesome. The built-in tuner is incredibly useful, too, while the USB output eases guitar-PC relations. We were sceptical at first, but the Ultra-III is the culmination of decades of tinkering and advancements in guitar technology, and it's a winner. Okay, so accessing the NanoMAG's controls on the back of the guitar is pretty awkward, and it's not going to replace your dreadnought, but hey, it's an electric guitar!